Ms. Helen Ching-Kircher and husband, Dr. Peter Kircher, made a generous donation to the Mt. Sinai Health System & the Arthritis Research Foundation in support of the ongoing efforts made by Dr. Keystone and his team. As long-time donors and friends of Mt. 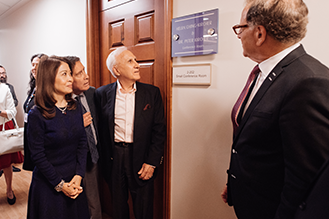 Sinai, Helen and Peter were also honored with a plaque and conference room in their name.